Our new, small accommodation offers a friendly and relaxed atmosphere. It's located in the Schuman area, near the European institutions. We have 12 delightful rooms, suites and apartments of various sizes in a splendid environment. The elegant avenues lined with majestic homes, a big variety of shops, cafes and restaurants are soundly blended with the atmosphere of Belgian cosiness, offering all necessary comfort to people living here. The location allows easy access to all Brussels' attractions and business destinations. 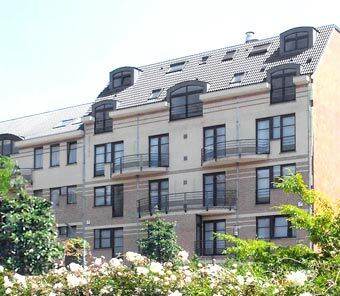 The Schuman area is within walking distance and you can reach the airport within 10 minutes. The city centre and the NATO are only a 5-minute drive away. You can take advantage of the many excellent facilities included in the price, such as an extensive breakfast, laundry service, phone calls (up to Euro/day), parking, snacks and drinks, use of our bicycles and internet. Some of our suites and apartments are situated in a beautifully restored historical building, 100 metres from the hotel, while other apartments occupy a little less prestigious, yet nicely renovated building at the same distance. The entire facilities are non-smoking. Check-in is from 13:00 - 22:00 and check-out from 07:00 - 12:00.